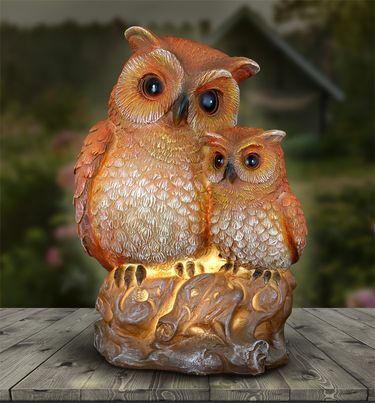 A tender moment is captured beautifully by day and illuminated by night in this Solar Owl with Owlet garden statuary. As they snuggle together and the sun sets, the solar powered LED light will magically glow from within. Sure to warm your heart, this statuary makes a wonderful addition to any garden. Size: 5" x 6.5" x 9.5"H., approx. 3 lbs.